The Departments of Education and Veterans Affairs (VA) have teamed up to notify veterans with severe disabilities that they may be eligible to have their federal student loans discharged tax-free. The Bureau has previously highlighted for years the opportunity to obtain a disability discharge. So, we are pleased to share with you the details of how the Department of Education will be reaching out to veterans who may be able to apply for a tax-free discharge of their student loans. In April, the Department of Education began matching their list of student loan borrowers with the VA’s list of veterans who are unemployable due to service-connected disabilities . From that process, the Department of Education created a list of federal student loan borrowers or recipients of Teacher Education Assistance for College and Higher Education (TEACH) Grants who may qualify for the Total and Permanent Disability (TPD) discharge. Already, the Department of Education and VA have identified over 42,000 veterans with severe disabilities who hold a total of more than $1 billion in outstanding student loans who may be eligible for TPD discharge. Over 11,000 of those veterans were in default with $168 million in outstanding loans. 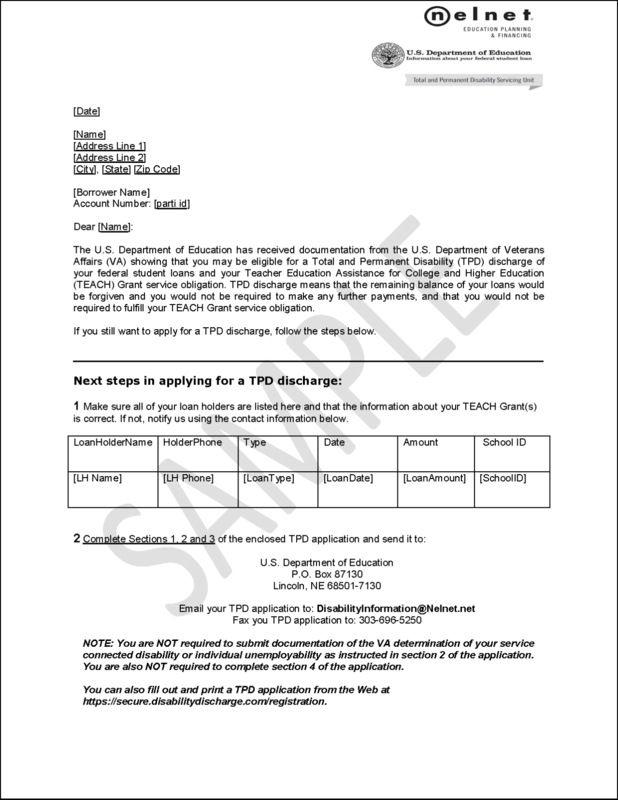 The Department of Education and Nelnet, the servicer administering the TPD discharge process, will send letters by mail similar to this sample letter to people whose records indicate possible eligibility for the discharge. The Department of Education and Nelnet manage a website to provide resources and more information on how to start your discharge application online. Even though disabilitydischarge.com is a “.com” website, it is the website that Nelnet uses to communicate with borrowers on the Department of Education’s behalf. You or your representative should only be using this service administered by Nelnet in the course of the loan discharge process. This is a free service and you do not have to pay any fees for the application. Ignore any services claiming they can help with your discharge for a fee, as they are likely scams. The easiest and quickest way to start the process is to apply online . The application will ask you some simple questions, like contact information and social security number. The good news is that if you received the letter, you do not have to submit documentation of your service-connected disability since the Department of Education already has obtained this information from the VA.
You can also start the application process by reaching out to the Department of Education via email or by calling 1-888-303-7818 during regular business hours. They will provide you the information you need to submit an application. Once the Department of Education receives your application, they will instruct the loan holder to suspend collection activity on your current student loans for 120 days while your application is being reviewed to determine if you qualify for a discharge. As part of the discharge, your loan servicer must refund all loan payments made after the effective date of the VA’s determination of your service-connected disability. If you have questions about TPD or the process, feel free to reach out to your student loan servicer. The Department of Education will work with the VA to conduct a new match of veterans with severe disabilities with the student loan database to identify more borrowers that may be eligible. Borrower notifications will be sent on a staggered basis each quarter. If you or someone you know may be eligible for a disability discharge and haven’t received a notification letter, you can find more information or start a TPD discharge application at www.disabililtydischarge.com . Read our tips on understanding your disability discharge options. View our tips, information, tools, and skill-building resources for people with disabilities. Learn more about free tax help , like the Volunteer Income Tax Assistance (VITA) program. Visit our Repay Student Debt tool. This interactive resource offers step-by-step information about repayment options, especially when facing default. Check out our tips to help student loan borrowers navigate problems with their student loans. Student loan borrowers experiencing problems related to student loans or debt collection can also submit a complaint. Are you a servicemember or a veteran with questions about credit cards, auto loans, or debt collection? The Bureau of Consumer Financial Protection provides help for servicemembers, veterans, and military families at every stage of a military career and beyond. See our guides for navigating financial challenges.